Overlooking the Jamestown Wildlife Refuge and the Sportsman Lake Salt Marsh. The SNOW GOOSE LODGE at LOG CABIN RETREAT is a Special Get-away! 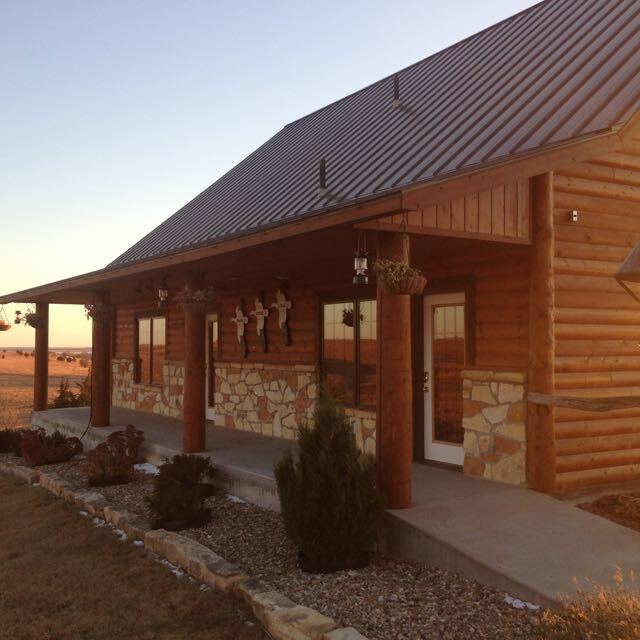 SNOW GOOSE LODGE is at top of the hill with breath-taking panoramic views overlooking Jamestown Wildlife Refuge and Sportsmans Lake salt marsh. As part of the Elliotts’ property, the Snow Goose Lodge is on the highest point overlooking the marsh. This log-covered building is an impressive 44′ x 36′ — including a Great Room 21’ x 30’ with fireplace, television, Wi-Fi and full kitchen area. The lodge is especially suitable for family and other reunions, anniversaries, hobby retreats, business and retreat conferences, corporate meetings, and other groups. The three lower-level enclosed bedrooms have their own shower bath facilities (both Sunset Room and Sunrise Room have queen size beds, and the handicap-friendly bedroom has a king bed, a walk-in shower, and an additional outside entrance). A covered porch off the Great Room provides outdoor sheltered scenic views. Click for more information. Come immerse yourself in a hide-away in the heart of a unique area of north central Kansas. This is an enjoyable setting for you. The Refuge and marsh consists of 10 acres of a Great Plains natural area, in beautiful rolling prairie pasture land. It has deep draws and small hills, hillside vistas, and magnificent overlooks to the Sportsmans Lake salt marsh and the adjacent Jamestown Wildlife Refuge. On-site at our facilities you can enjoy surrounding flora, fauna, with migratory bird fly-ways and much wildlife — all yours to see and enjoy with only some effort. 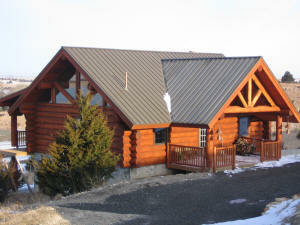 The property includes the original owners Log Cabin built in 2004-05, and the Snow Goose Lodge for guest was finished on the highest point in late 2009. This can be your retreat place. It also is a special mecca for birdwatchers, photographers, hunters, nature lovers, and just lovers. With Snow Goose Lodge’s spectacular views, this especially can be your place for personal time, or family gatherings, reunions, hobby retreats, conferences, and special gatherings. The Elliotts with loving hands constructed everything on the property. With faith-centered lives, they wish to share the unique experiences of this place. It is a place to call yours for a time. 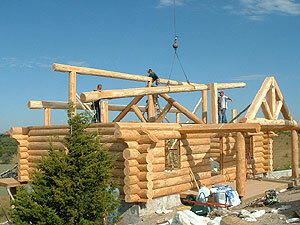 The LOG CABIN was built over a period of 19 months during 2004-05. This well-appointed classic modern log cabin is made from some of the largest available Canadian logs. Logs used in the construction of the cabin in the spring of 2004 were still standing in an old “slow growth” forest of Douglas Fir trees growing in the British Columbia Cascade Mountains above Kamloops, B.C., Canada. (Slow growth wood is more dense and stable than other wood.) The craftsmen of Mountain High log home manufacturer in Kamloops, headed by Doug and Mary McCulloch, cut the logs, dried them over the summer, and built the cabin in a carving yard. Each log was hand peeled, scribed, and fitted tightly to the log below, with corners fitted in a Scandinavian style notch. Additional information is on their website: www.mountainhighloghomes.com. You have options. Our lodges area a place you can enjoy alone or it can be your romantic hideaway. It can be a place of adventure. It can be a special place just for you and friends. It can be a center from which to do nearby hunting and fishing (in-season). Private parties can be arranged. You can take in nearby historic and/or Kansas rural sites. Or you can just lounge and relax in this special retreat. You’ll see why this is a very special, treasured place — built with loving care by the Elliotts. We request No Smoking inside any of the buildings.